In response to fan requests, Capcom has detailed the Devil Breakers and Cavaliere R that come with Devil May Cry 5‘s recently announced Deluxe Edition. Without further ado, check out the official descriptions below. This is a version of Gerbera that features alternate coloring to pay tribute to its designer, Shoji Kawamori. 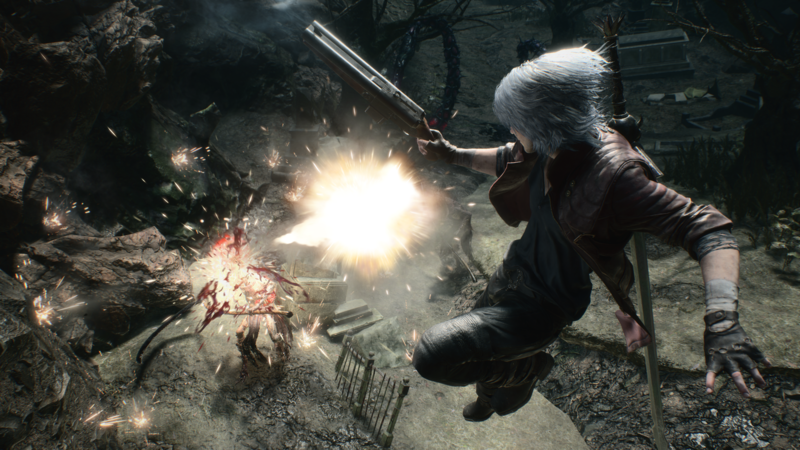 From a functional perspective, it features one alternate move compared to your standard Gerbera – when you use this Devil Breaker and keep the control stick neutral, Nero will perform “Jocky” and dart upward (from the ground) or downward (from the air), rather than sticking his hand out to face palm any enemies or projectiles that might be right up on him. Nico fashioned this together using spare parts from other Devil Breakers and various kitchen utensils in order to help Nero twirl up that dinner of his. Since it was never intended to be used in battle, it’s not going to do much damage to enemies. Every time you use it, however, the remaining Devil Breakers in your inventory will cycle one spot. This means that it’s the only weapon that allows you to switch it up for the next Devil Breaker – should you choose. Because it’s not particularly effective in battle, however, you’ll want to think long and hard about whether you’d prefer to use up a spot in your DB inventory before taking the plunge. As long as Nero has this equipped he’s not going to be able to attack demons with it at all, but you can use it to slowly regenerate some health. If you’re really in a pinch, you can use Sweet Surrender’s Break Age ability to regenerate a bigger chunk of health. Either way, as long as you have Sweet Surrender equipped you’ll have to focus on racking up those sweet combos with Blue Rose and Red Queen. Cavaliere R is a version of Cavaliere that Nico has tuned up and painted specifically for Dante.From a functionality perspective, it adds one new move, but Dante is more susceptible to being broken out of his attacks when compared to the OG Cavaliere. Sure, you have one more move at your disposal – but you’ll have to think about whether that trade-off in losing the super armor is really worth it! As for the Mega Buster, Capcom’s Matt Walker redirected fans to a previously released video of the Devil Breaker that you can find in our recent coverage, which also details the Deluxe Edition. Devil May Cry 5 will release on March 8, 2019 for the PlayStation 4, Xbox One, and PC.